More firm action needs to be taken against brutalizing of strays here as complaints of cruelty to animals seemed to have fallen on deaf ears. Nowadays, the issue of animal abuse are becoming more common. Every day, there will be issues involving either animal torture reported in the newspapers or ones that happens in front of your own eyes. Animals such as cats and dogs often become victim to the cruel perpetrators who tortures and kill without mercy. These are inhumane acts! 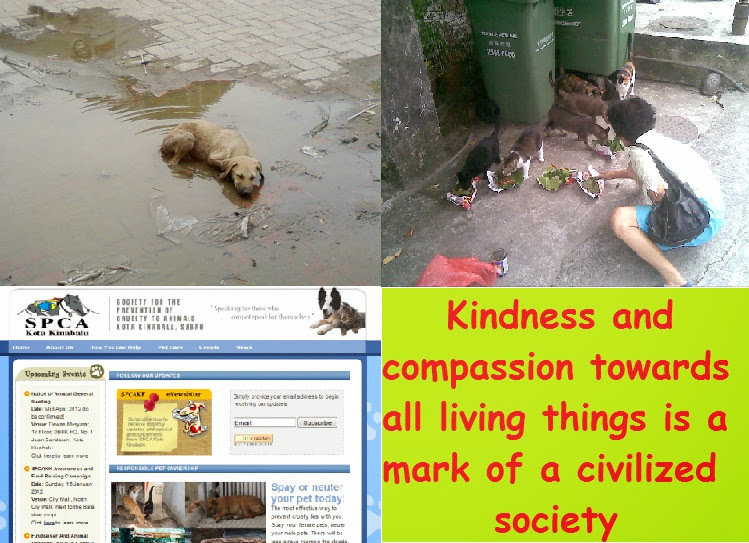 Is the human compassion recedes that they willing to commit such acts? Such cases often do not get proper defense because it is considered common practice for some people. Patron of the Society for the Prevention of Cruelty to Animals (SPCA), Tan Sri Lee Lam Thye said the association hoped that there will be a new law relating to the welfare of animals in order to end inhumane acts against animals. This too will indirectly help improve Malaysia's position in the world in terms of animal care. Previously, there was heard that a draft on animal welfare law that provides for stiffer penalties for animal abusers is expected to be tabled in Parliament earlier this year. The draft provides for a fine of between RM20, 000 to RM100, 000 or imprisonment of up to three years or both. Hopefully there will be a best solution can be achieved to stop animal abuse in this country. One of the better ways to address the issue of cruelty to animals is to foster a love for all animals besides imposing heavy law on animal abusers.